Labour leader Jeremy Corbyn has spent his life campaigning for peace and speaking out against military action. He was one of the UK's leading campaigners against the 2003 Iraq war - and also voted against British involvement in military action in Afghanistan and Libya. In fact, he has voted against every military action proposed by the UK government during his 35 years in Parliament. He is also firmly opposed to air strikes in Syria in response to chemical attacks, arguing that it will escalate tensions, although it looks increasingly likely that MPs will not be given a say on that.Before entering Parliament, he spoke out against the Falklands War and cut his political teeth campaigning against the war in Vietnam, a conflict Britain supported without committing troops.Yet Mr Corbyn insists he is not a pacifist - and there is at least one example of him backing British troops in a foreign war in the past. "The best defence for Britain is a government actively engaged in seeking political solutions to the world's problems," he said in a speech to the Chatham House think tank before last year's general election. "This doesn't make me a pacifist. I accept that military action, under international law and as a genuine last resort, is in some circumstances necessary. "But that is very far from the kind of unilateral wars and interventions that have almost become routine in recent times." Pushed afterwards for examples of military action he thought had been justified, he said: "I doubt many, if any, in this room would have questioned the legitimacy, ultimately, of the Second World War. "Because of the catastrophe that had approached by the rise of the Nazis all across Europe to that point. And so I think there has to be, ultimately, that preparedness to use military force. "On the other hand, he said "many" would have questioned the legitimacy of the First World War.In more recent times, he said British forces had done "great" peacekeeping work in Cyprus and he praised the "incredible work done by the Royal Marines and others in helping refugees to survive" in the Mediterranean.One military action he gave unequivocal backing to was the UN-backed intervention in East Timor in 1999, when troops were sent in to quell violence after a UN-sponsored referendum showed overwhelming support for independence from Indonesia. The Labour leader said he had been a UN observer at the East Timor referendum "which had come at the end of an appalling civil war that had gone on for decades, in which tens of thousands of people had lost their lives. "And that UN intervention, to enforce the ceasefire, by and large worked. 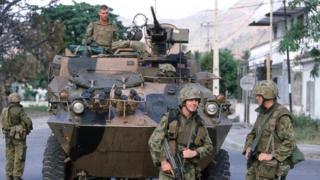 "Australian forces took the lead in East Timor, with eventual support from 21 other nations, including the UK, which sent a small contingent of Royal Marines, thought to be members of the Special Boat Squadron, and 250 Gurkhas.Mr Corbyn also suggested the UN should have intervened in 1994 to stop the genocide in Rwanda, and argued that more could have been done to promote a ceasefire in the civil war in the Democratic Republic of Congo, which he said had "probably claimed more lives than any other conflict since the Second World War". "There seems to be an assumption that a war in Africa is somehow or other different to something on the edges of Europe," he told the Chatham House audience.He stood by his opposition to the Nato-led action in Kosovo in the late 1990s, which was carried out without the explicit backing of the UN security council, saying the situation there was "not good" and it could have been dealt with "in a different way".Mr Corbyn also opposed Tony Blair's May 2000 decision to send troops to Sierra Leone to back the government in its war with rebel forces to re-establish democracy - cited by successive British prime ministers as an example of a successful military intervention.The decision was not debated in the Commons until the day the main contingent of British forces left the West African country, having restored order. "Why cannot British troops be placed under UN command, so that it is clear that they are part of the UNAnd this seems to be the point about Mr Corbyn's attitude to military action. He thinks it should only be done as a last resort - and only then if the United Nations agrees to it.